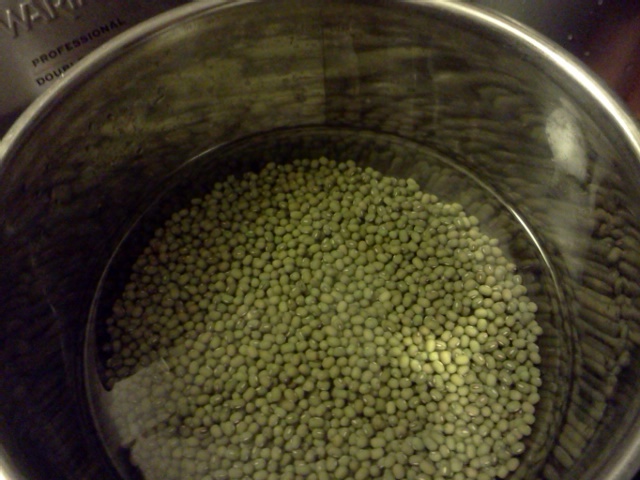 SOAKING beans so they can absorb water and soften for quick cooking. I thought about the word SOAK today as I SOAKED my clothes in the washer while doing laundry and SOAKED some mung beans for an easy-to-cook soup for dinner. About 6 hours later, the beans were soft and cooked IN NO TIME (very quickly) after I added some sauteed onions, mushrooms, and carrots. TO SOAK here means to submerge or to place in some liquid (often in water). In the same sense, when we take a bath, we can say that we're going to SOAK in the tub. SOAK is also synonymous with "absorb". Indeed, when we SOAK the clothes, we're letting it absorb the soapy water. Similarly, when we SOAK beans, we're also letting them absorb water so that they soften and cook quickly. It's the same idea when, on a sunny day, we lie on the sand at the beach or on the grass in the park in order to SOAK UP some sun. Also, when it's raining, we can get SOAKED or SOAKED TO THE BONE or SOAKING WET when we forget our umbrella. Alright, folks. I hope you enjoyed this quick vocabulary lesson. I thought it was a cool word to know and use. In the coming weeks, I hope you find some time for a relaxing SOAK (n.) in the tub, and I hope you don't get SOAKED the next time it POURS (rains hard). Don't forget to use the buttons below to share this post with your friends. Until next time!